Limited Edition Bullitt Carbon Ace Cafe Blackjack Helmet – made by Bell Helmets. Three Day FREE Motorcycle Rental from Eagle Rider USA. Your choice of a Dainese Men’s Heston or Ladies Kiera Leather Jacket. 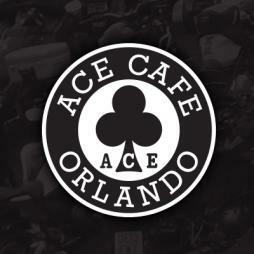 Set of three Ace Cafe Orlando branded tee shirts and a cap. Ace Times Coffee Table Book. As a Summer Sweepstakes entrant, you will also start receiving the latest news, event schedules and promotion details – along with discount opportunities. 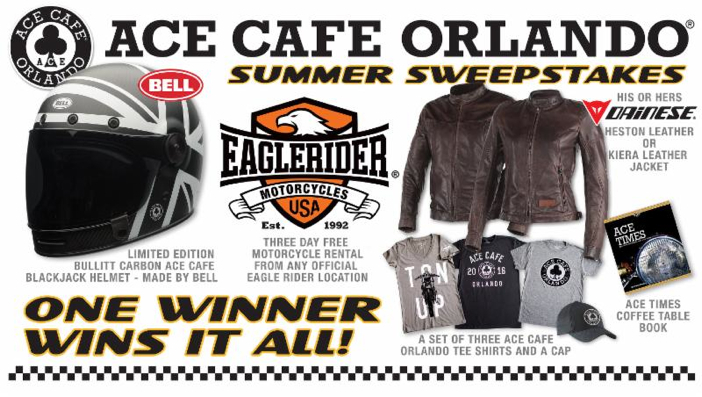 Ace Cafe Orlando Summer Sweepstakes runs through September 21, 2016. There will be only one winner and that winner will win all of the items shown above. Only one entry per person allowed. You must be 18 years of age to enter. Ace Cafe employees and their relatives are not eligible. The winner will be selected via a random selection and will be notified via email or phone call. The winner will be announced on or before October 1, 2016. The product will be shipped directly to the address provided on your entry.